Chemung Financial Corporation is a $1.7 billion financial services holding company headquartered in Elmira, New York and operates 34 retail offices through its principal subsidiary, Chemung Canal Trust Company, a full-service community bank with full trust powers. Established in 1833, Chemung Canal Trust Company is the oldest active independent bank in New York State. 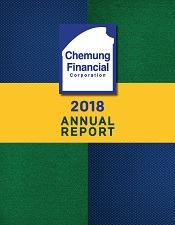 Chemung Financial Corporation is also the parent of CFS Group, Inc., a financial services subsidiary offering non-traditional services including mutual funds, annuities, brokerage services, tax preparation services and insurance founded in 2001 and Chemung Risk Management, Inc., a captive insurance subsidiary founded in 2016. © 2019 Chemung Canal Trust Company, All rights reserved.